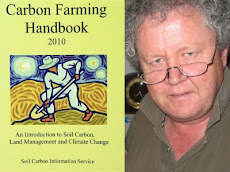 The Green Paper ‘puzzled’ the supporters of Soil Carbon Trading by introducing novel arguments against its inclusion. Wheresas all the discussion during the consultation period focussed on the standard objections, ie. 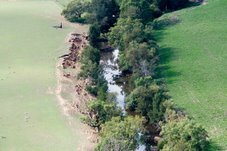 ‘difficult to measure’, hard to hold, additionality, etc., the Green Paper introduced the arguments of the danger of large emissions from drought (bare earth) and bush fire. 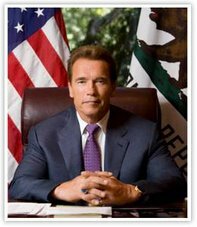 And there was a passing reference to “changing land management” (ie. farmers reneging on their agreements). A fully-‘carbonised’ landscape has groundcover and so is cooler. This was demonstrated by a field experiment which tested the temperature at 1cm below the surface in a series of plots near Bibby Springs area over the 2002/03 summer. Bibby Springs is between Badgingarra and Cervantes in WA, approximately 20 km from the coast. Tim Wiley, who conducted the research, says: "The results show that ground cover keeps the soil cooler in summer. Actively growing perennials moderate the microclimate even further. The bare soil got was up to 30 C warmer than the Kikuyu plots (i.e. maximum of 33 C compared to 63 C). These differences in soil temperature have significant implications for soil biology and health. The bare sand had 555 hours when the temperature was above 40 C."
A “Carbon farmer” is less likely to bare the soil because they know how important topsoil is. Such a landscape is also more perennialised, and so retains more water in the upper profiles. Emissions from fire are less likely to be as damaging as in conventional systems. 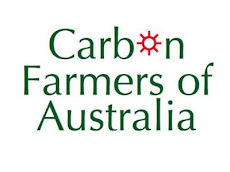 And finally, growers who reneg on carbon contracts pay a penalty. 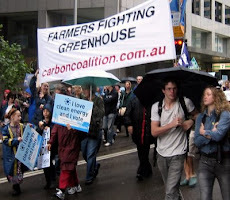 Carbon farmers have been taught first hand by Nature how to behave.